Just complete the form below to be provided with your own completely free ResourceSpace installation with 10GB of asset storage. Please complete the form below to request a user account. Now with Google Vision API integration! 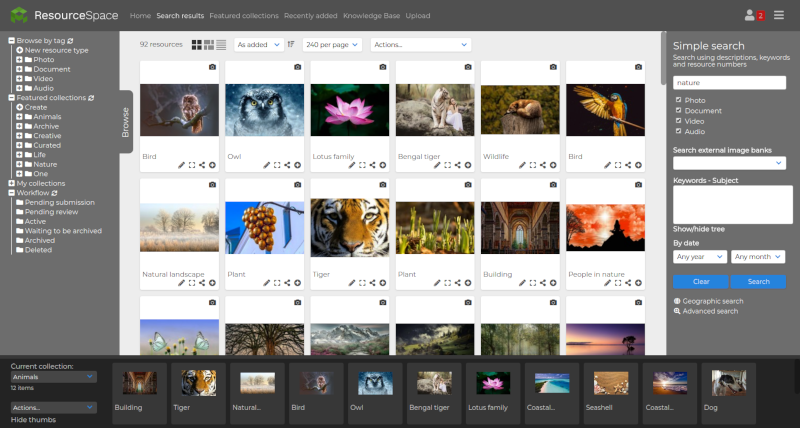 Simply upload assets and ResourceSpace will automatically suggest tags for you based on the image content. Please enter a short name to use for the URL of your system, such as the name of your organisation. Valid characters are a-z, 0-9 and underscore. Maximum 16 characters; must start with a letter. I can't say enough about ResourceSpace; it is where some of our most powerful content lives, and we are able to organize, manage and make use of that content more effectively because of this invaluable system. With ResourceSpace our users can view high quality images fast and see different file formats, including SWF and audio files, in one place, and we can edit large amounts of data in one go! And their service team is quick and extremely helpful.